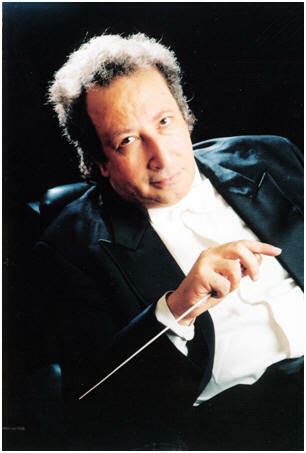 Maestro Ahmed El Saedi is the main founder and chairman of the Egyptian Philharmonic Society, which, since 2004, has become a serious platform for presenting standard chamber orchestra repertoire in addition to masterpieces of chamber music performed by Egyptian and international musicians on a higher musical calibre. He has studied at the Hochschule für Musik und Darstellende Kunst in Vienna with Othmar Suitner (conducting), Friedrich Cerha (composition) and Franz Eibner (theories of Heinrich Schenker). . He has also studied conducting and musical phenomenology with Sergiu Celebidache in Germany. El Saedi’s international debut took place, in 1982, conducting the Slovakian Chamber Orchestra at the Wiener Konzerthaus in Vienna. Since then, he has collaborated as a guest conductor with over fifty orchestras and opera houses all over the world, including the Prague Chamber Soloists, the Suk Chamber Orchestra (Prague), the Poznan Philharmonic Orchestra (Poland), the Lithuanian National Symphony Orchestra (Vilnius), the Royal Philharmonic Orchestra (London), the West Virginia Symphony Orchestra (USA), the Györ Philharmonic (Hungary), the Prague Radio Symphony Orchestra, the Orchestra da Camera Milano Classica (Milan), the Orchestra da Camera Florentina (Florence), L'Orchestre de la Société Philharmonique de Montréal (Canada), the Sofia National Opera (Bulgaria), His perspective engagements include concerts in Prague, Seoul, Moscow, etc.. Maestro El Saedi has performed in many prestigious halls, such as the Wiener Konzerthaus, Musikverein Wien, Österreichischer Rundfunk Grosser Saal, Berlin Philharmonic, Liederhalle (Stuttgart), Ötkerhalle (Bielefeld), Kieler Schloss (Kiel), the Ateneul Roman (Bucharest), the Rodolfinum (Prague) and the Place des Arts Théâtre Maisonneuve (Montréal). Moreover, his participation in festivals such as the Festival Lyrique de Saint-Céré (France), Nuits Musicales du Suquet (Cannes, France), Zagreb Summer Festival (Croatia) and the Plovdiv Verdi Festival (Bulgaria) has been met with standing ovations. El Saedi’s perspective engagements include the Prague Chamber Orchestra, the Royal Omani Symphony Orchestra, the Cairo Symphony Orchestra. The Cairo Opera Orchestra, the Lebanese Philharmonic Orchestra, the Qatar Philharmonic Orchestra, the Egyptian Sinfonietta and the Prague Symphony Orchestra. His permanent engagements have included the Wiener Virtuosen Chamber Orchestra (1986-1988), The Egyptian Chamber Orchestra (1989-1995), the Cairo Symphony Orchestra (1991- 2003) and since 2003, the newly founded Philharmonic Chamber Orchestra. He was also the founder and mentor of the Cairo International Workshop for Orchestral Conducting (2001 & 2002), of the Arabic Perspectives Festival of the Cairo Symphony Orchestra (2002), and the artistic director of the Cairo Music Competition (2004-2010). Also, he was the mentor of the Workshop for Prospective Band Conductors in Bahrain(2007). Maestro El Saedi’s discography includes Alexander Glazunov's Saxophone Concerto in E-flat Major, op. 109 (1931), the Piano Concerto (1959) and Intermezzo from the opera Anas Al-Wogood (1966) by the Egyptian composer Aziz El Shawan (1916-1993), concertos for double bass and orchestra by Giovanni Bottesini (1821-1889), Giuseppe Antonio Capuzzi (1755-1818) and Giovanni Battista Cimador (1761-1805) with soloist Gerd Reinke, Ludwig van Beethoven’s nine symphonies, five piano concertos and Choral Fantasy, op. 80, featuring Egyptian pianist Ramzi Yassa as soloist. El Saedi’s compositions, which have been performed internationally with great success, include works for orchestra, chamber orchestra, chamber music ensembles, voice and works for the media. His achievements have been recognized in a broad range of awards including the Villa-Lobos Centennial Medal from the State of Brazil (1988), the State Prize for Composition (1995) and the State Prize for Outstanding Achievement in the Arts (2000) from the Egyptian Ministry of Culture, and the Austrian Cross of Honor for Science and Art (2004). Currently, Maestro Ahmed El Saedi is the Music Director of C.S.O. since September 2014.